Congressman Adam Schiff was called out Thursday morning for two years of railing about “conspiracy” involving President Trump at the outset of a meeting of the House Intelligence Committee, as Republican members of that committee called upon him to step down, according to Mediaite. 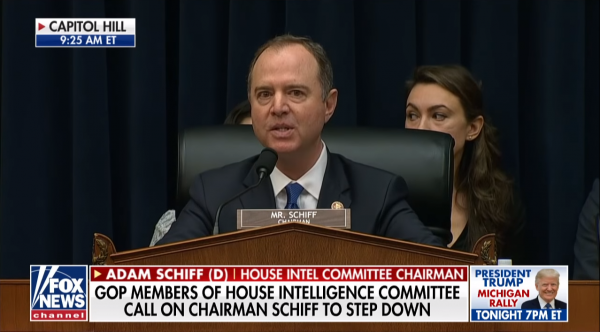 Reacting to the demand, Schiff offered a defense of his actions by telling Republicans that they “might think it’s okay” for several things to have occurred during the campaign that raised questions about people involved, including Donald Trump, Jr., “but I don’t.” The full exchange may be seen here. Schiff has been levelling allegations of collusion for some time, but the Washington Times report said Republicans point to the Clinton campaign as the real source of any possible collusion. It was the Clinton campaign, they assert, that hired someone to collect “disinformation” on Trump from Russia. Schiff has not been the only Democrat pushing the “collusion” theory in the aftermath of the 2016 election, which saw Trump win a surprise victory over Democrat Hillary Rodham Clinton. So stunning was her defeat that it left supporters, and even some in the media, with tears on election night. The confrontation happened at the opening of a hearing on Russian influence operations that featured a trio of “expert witnesses,” the newspaper said. But a new Rasmussen poll released Thursday morning shows that 61 percent of likely voters think Congress should “move on to other issues” now that the Mueller report has been delivered. Only 31 percent think Democrats should launch their own investigation. But that number could be very partisan, according to Rasmussen’s data. A different Rasmussen survey shows the president gets a thumbs-up from 50 percent of likely voters in the daily presidential tracking poll. Clearly, it appears Democrats are simply unwilling to give up their efforts, which many believe have been an attempt all along to distract the Trump White House and prevent the president from advancing his agenda. In effect, they’re running interference.